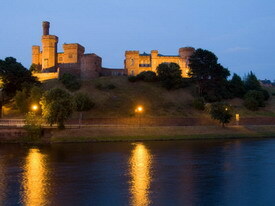 Inverness is best known as being the capitol of the Highlands and it is one of the fastest growing cities in Scotland. There are some fantastic attractions in the city and surrounding area and it provides an excellent base for touring the highlands. 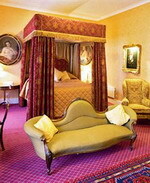 There is no shortage of accommodation with a wide selection of bed and breakfasts and hotels in Inverness. 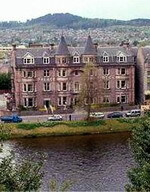 A turreted granite building situated on the banks of the river Ness, the Best Western Palace Hotel and Spa is located in the center of Inverness, within sight of Inverness castle. With large windows overlooking the River Ness and the castle, the hotel restaurant is open for breakfast lunch and dinner and serves a range of Scottish dishes with a contemporary international twist. The leisure club and spa onsite include an indoor swimming pool, sauna and steam room, and a solarium. Beauty and spa services are offered, and there is also a fitness room. Guests can also enjoy a drink in the lounge adjoining the swimming pool, and room service is offered at certain hours. The hotel is one kilometer from the city center main shopping area; highland attractions including Loch Ness are within 20 miles, and Inverness Airport is less than 10 kilometers away. 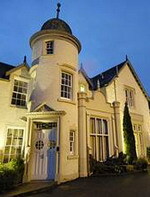 Built in 1880 this country house-style hotel has a modern wing and is situated in a quiet residential area of Inverness city center, within 800 meters of shops, Inverness castle, museum and art gallery. The hotel's leisure club offers a heated swimming pool, sauna and fitness equipment. The Conservatory offers a bistro-style menu with vegetarian options, for lunch and dinner daily. Dry cleaning and laundry services are available. The hotel also has a conference room and banquet facilities for gala dinners and social functions. Inverness city center is compact and easily accessible on foot and shops and restaurants can be found 500 meters from the hotel. Visitors hoping to catch a glimpse of Scotland's most famous monster can head out to beautiful Loch Ness, around 11 miles away. For those arriving by plane, Inverness airport is eight miles away; the number 11 bus runs every 90 minutes from the airport to city center. A pretty 18th century property set in acres of gardens in the Scottish Highlands, 1 mile from Inverness city centre and 12 miles from the famous Loch Ness. Guests can head to the health club for a swim in the heated pool or a dip in the bubbling waters of the spa tub; towels are provided. Active guests can work out in the gym. Those feeling less energetic can relax in the sauna and steam room or indulge in a range of health and beauty treatments at the spa.The Kingsmills Restaurant is furnished with tartan fabrics and period details and serves a menu of traditional Scottish dishes made using locally sourced produce. The hotel is surrounded by beautiful countryside and there are 25 golf courses within an hour drive of the hotel including the Loch Ness Golf Course, the Royal Dornoch course and the Inverness golf course. Nearby guests can enjoy plenty of outdoor pursuits including hiking, hunting, mountain biking, rock climbing and nature trails. The hotel can arrange activities including clay pigeon shooting, fishing and horse riding. There are numerous castles, lochs and wildlife parks all within 27 miles. Inverness Airport is nine miles away with an approximate driving time of 15 minutes. 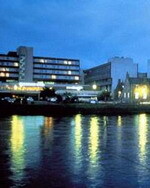 The modern, six-storey Ramada Inverness boasts a river- front location in the city centre, 12 miles from famous Loch Ness. Guests can swim lengths of the indoor pool, work out in the gym and relax in the sauna and hot tub at the health and fitness centre. Breakfast and dinner are served in the Arts Restaurant, which boasts views of the River Ness, while lunch is available in the hotel's Caffe Jarva. Drinks and cocktails are available from the bar and guests can enjoy light meals in the privacy of their rooms at any hour thanks to 24-hour room service. The hotel is well located for exploring the local area. Boats leave on dolphin cruises of the Moray Firth one mile from the hotel and important historical sights including the Caledonian Canal, Castle Stuart, and Culloden battlefield are within eight miles. Inverness airport is nine miles and about a 15 minute drive from the hotel. 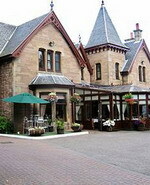 The Royal Highland Hotel is located in Inverness, Scotland. It is next to the train station and business centre. This imposing historical hotel has a 24-hour front desk and serves room service around the clock. Complimentary Internet access is available in public areas, and working guests can make use of conference rooms and business services. The Royal Highland Hotel houses a bar and restaurant. The guestrooms feature wireless Internet access as well as satellite television, direct- dial phones, and coffee/tea makers. The Thistle Inverness is located less that two kilometers from Inverness, the capital of the Highlands in the United Kingdom. This modern property stands near Inverness Castle and is positioned 24 kilometres from Loch Ness. The smoke-free Thistle Inverness features a contemporary lobby with intimate sofa arrangements, potted tropical plants and recessed lighting. Cromarty Brasserie, the hotel's informal eatery, prepares a range of international dishes. Dornach Bar serves light snacks from the bar menu and offers wireless Internet service. Four function rooms accommodate up to 230 attendees. The Otium Health and Leisure club contains an indoor pool, a children's splash pool, a sauna, a steam room, a spa tub and fitness equipment.